One of the things that stand us apart from the other boats, is our 4 full time, resident entertainers. We have 2 singers and 2 dancers, 1 for each of our 2 boats. Over many years, we have been experimenting with different things that work best with the very diverse people visiting our boat. Please fill in the form and our reservations team will get back to confirm availability shortly. Our reservations team will get back to you shortly via email regarding availability. You might be wondering, what is a Dhow Cruise, and what is Dubai marina and what do they have in common? 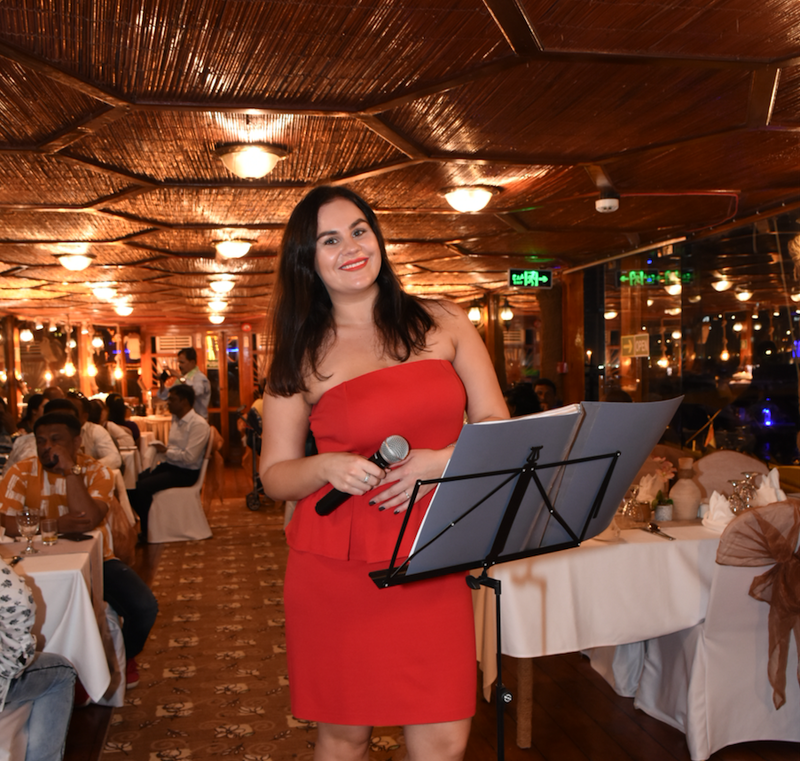 Thus a Dhow Cruise Dinner in Dubai Marina is a dinner cruise onboard a Dhow Vessel with a Live show and International Buffet Dinner. Dinner Cruises in Dubai Marina have quickly become a part of the norm and now are part of the standard Things to Do in Dubai. 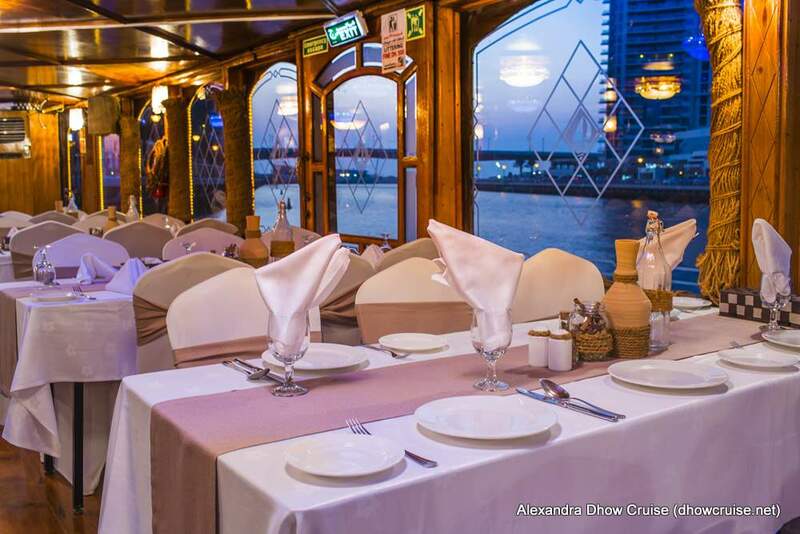 Initially Dinner Cruises have been operated exclusively in the Creek, but with the opening of Dubai Marina, this tradition quickly transferred over to this part of town. 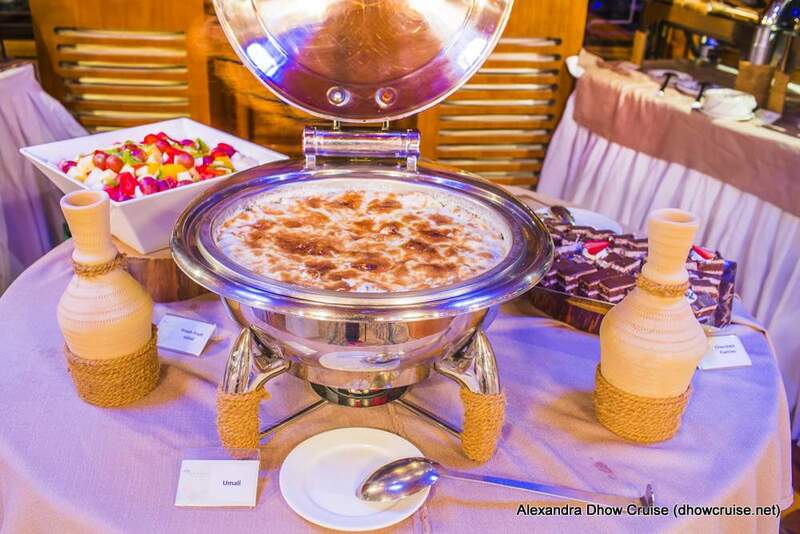 Onboard Alexandra, we offer a rather extensive International Buffet Dinner with 5 salads, 7 main course dishes, a seafood soup and 4 dessert options. We serve a small appetizer onboard for the guests upon arrival, until the boat pushes off and the buffet is opened. We also have onboard a live program consisting of a ‘Tanura’ dancer, originally a dervish traditional dance that is extremely colourful and interesting to watch. It is essentially a man dressed in a very elaborate dress with lights that spins for approximately 15 minutes, creating a wide array of patterns and twirls with his skirting lights. Its rather hard to describe in words, and must be seen. 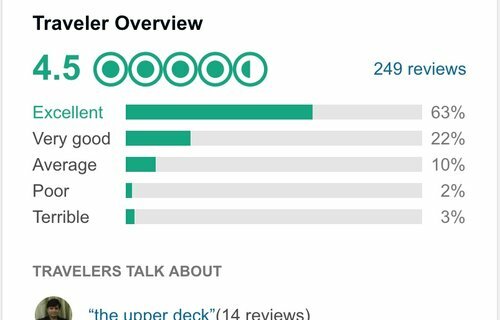 WHAT ALTERNATIVES ARE THERE FOR A DUBAI DINNER CRUISE? Well, the only other alternative to a dinner cruise onboard a Dhow is a ‘House Boat’, an ultra modern, square shaped boat that is essentially a house on water. 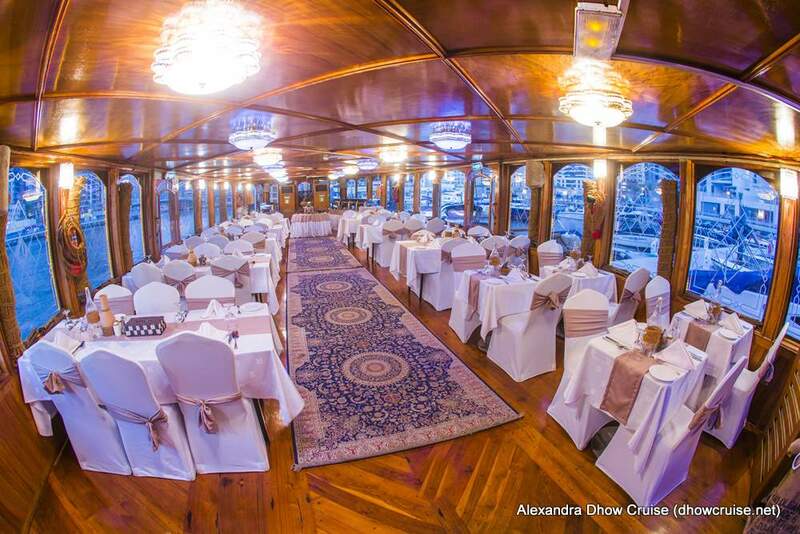 There is definitely some advantages to this form of dinner cruise, however it does not have the charm of the traditional lifestyle that is local to the UAE. 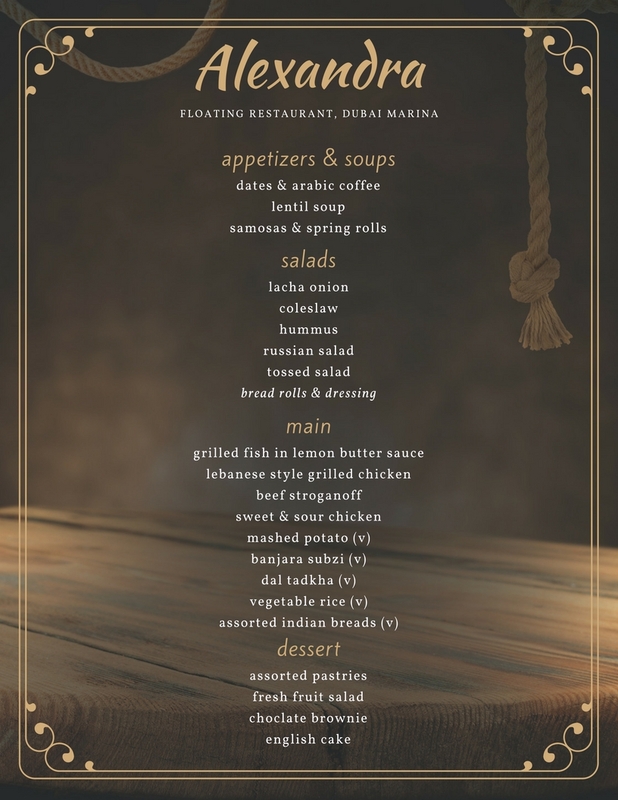 The Dhow Cruise Dinner in Dubai Marina provides a very existential and philosophical contrast between the new and old. A traditional wooden boat that has been used for decades in an area that looks like its from the future.